Amy Schumer has shared pictures of her "secret" wedding. 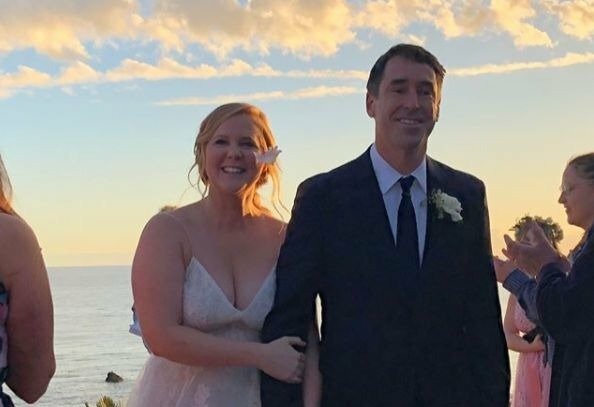 Amy Schumer is officially a married woman! Just months after her romance with chef Chris Fischer started, Amy walked down the aisle. The comedian and actress confirmed she got married a day before Valentine's Day. The 36-year-old tied the knot during a romantic ceremony held at a $23-million beachfront home in Malibu. Some of the star-studded wedding guests in attendance included Jennifer Lawrence, Jake Gyllenhaal, and Jennifer Aniston. Lawrence says she couldn't be happier for her friend. “It was beautiful. It was very sudden, but it was, I was sobbing the whole [time]. His vows were stunning. It’s when two people really love each other and they really mean it, it shows, and it was a beautiful ceremony and an amazing time," she told Entertainment Tonight. Amy reportedly walked down the aisle in a $5,000 Monique Lhuillier dress. She took to Instagram to share pictures from her wedding day. Some people have claimed that the 'Train Wreck' actress tied the not with such urgency because she is pregnant. She was quick to shut down the rumours.